Here's the most recent thing to come out of the sewing room. 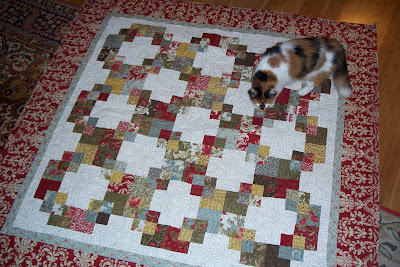 I love this quilt and I especially love the border (Penny the cat seems to like it too). I am just loving red and white lately. 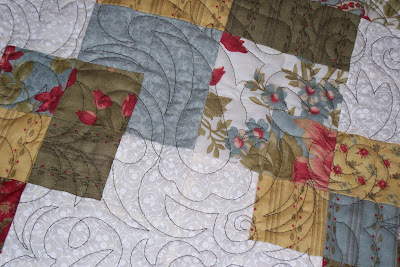 The center of the quilt is made with Roman Holiday charm squares by 3 Sisters for Moda which I have had for a while. Don't you just love anything Moda? I could not buy the border fabric that came with this group, it's sold out everywhere, but got this fabric from another 3 Sisters fabric group called Glace. The pattern came from Heather Peterson's Charmed and Dangerous book. My quilter did a paisley looking quilting pattern which compliments the quilt nicely. I don't even know what I'll make next. I have been so busy at work I don't know night from day. Some sewing time is just what my spirit needs so I'll be at it again soon I'm sure. By the way, the fall banner is up because it was really cool here this morning. It feels like Autumn is here to me! That is such a neat pattern, the border fabric looks great with the Roman Holiday fabrics. I made a quilt using the Roman Holiday fabric too, don't you just love it? Very pretty quilt & Penny is so sweet to give her approval. Your new quilt is very pretty! I like the pattern. Thank-you for your visit and your comment on my blog. 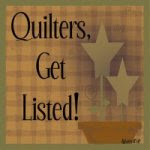 Your quilt is just wonderful...Roman Holiday was one of my very favorites...love your border! Beautiful! I love the fabric colors too, and the border is beautiful. Ahhh... a cat named Penny... that's my name. :o) How sweet! 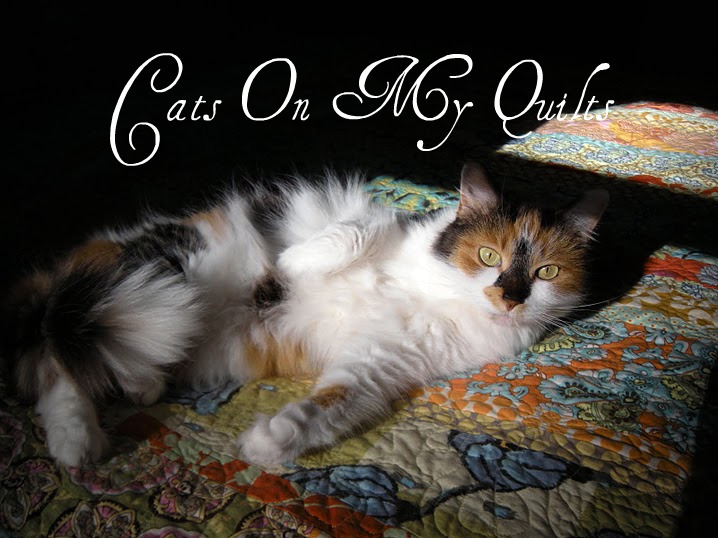 I love your quilt!! The border is perfect. Beautiful. Love the pattern and colors. That little quilt is really beautiful. I love the colors! I think that red has become one of my favorite decorating colors. Penny is adorable, too! I so admire your talent. I wish I could sew, cook, quilt. Maybe in the future. What a very very pretty quilt! I love the border fabric you came up with, too. Of course I really think Penny *adds much* to the overall quilting. Just my humble opinion of course but she IS so cuteamous!!! WOW, that quilt is just beautiful. I love anything Moda and the Roman holiday is so eye catching. The border fabric goes well and is also very beautiful. I do love that red border too! Its a great quilt and one I know you have to enjoy for many years to come. The quilt is stunning. I love the Glace' border, too! Looks right at home with the other collection of fabrics. Love the banner and the quilt!